Gap Inc. (GPS.N) says it will shift its focus to its growing brands Old Navy and Athleta, and away from the Gap and Banana Republic. The company said Wednesday it will close about 200 Gap and Banana Republic stores in the next three years and open about 270 Old Navy and Athleta stores during the same period. The San Francisco-based company says Old Navy is on track to surpass US$10 billion in sales in the next few years. And Athleta, which sells athletic clothing, is expected to exceed US$1 billion in sales. The company expects to reap about US$500 million in savings over the next three years by better taking advantage of its scale. The moves are the latest to reinvent the chain and are being spearheaded by CEO Art Peck, who took the helm in 2015. The company is facing the same problems as other fashion retailers, as shoppers buy less clothing in general and shop more at off-price chains or buy online when they do. That has resulted in sluggish traffic at the stores. But Gap Inc. also has long struggled with its own problems, mired in a sales slump as its clothes don't stand out in an overcrowded landscape. Gap has been offering frequent discounts to get shoppers to buy. It's also been working hard to improve fit - a problem that has long bedeviled the retailer- and it's been trying to rework its fashions. The company has been cutting its store numbers over the last few years. 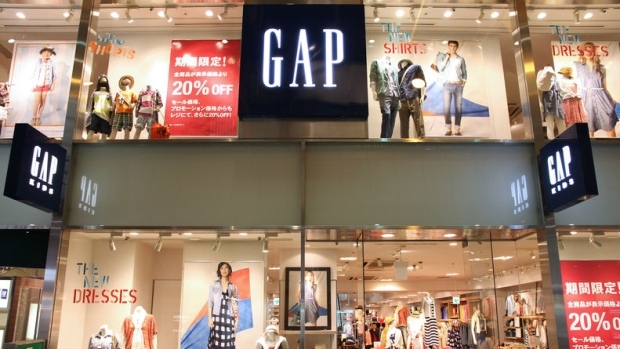 Shares of Gap rose more 5 per cent to US$25.32 in late morning trading.